How Is Your Office Space Affecting Your Gender Diversity Recruiting Efforts? Maybe it’s the fact that I am a woman so I have a heightened sensitivity to the subject, but it seems that gender diversity in the workspace is a hot topic lately. All weekend I have wondered, how does office space affect a firm’s ability to improve its gender diversity? Let’s look at this from the job interview perspective. If two candidates, one male and one female, walk into a company’s reception area before an interview and the space is wood paneled, traditionally furnished, and features portraits of the company’s older white male founders on the wall, which candidate do you think is going to feel more comfortable? Who is going to feel like they might fit into the culture of the firm? Consider the same scenario but this time the lobby is bright, colorful and furnished with overstuffed chairs upholstered in floral patterns. Now who is going to feel more comfortable? Is there such thing as a gender-neutral aesthetic in office space? I recently had the opportunity to tour the offices of Bridgeworth Financial, a financial services firm headquartered in Birmingham, with its founder, Delynn Zell. Zell said that when Bridgeworth’s space was designed, she asked the designer to make the space calming, peaceful, and not over-stimulating. 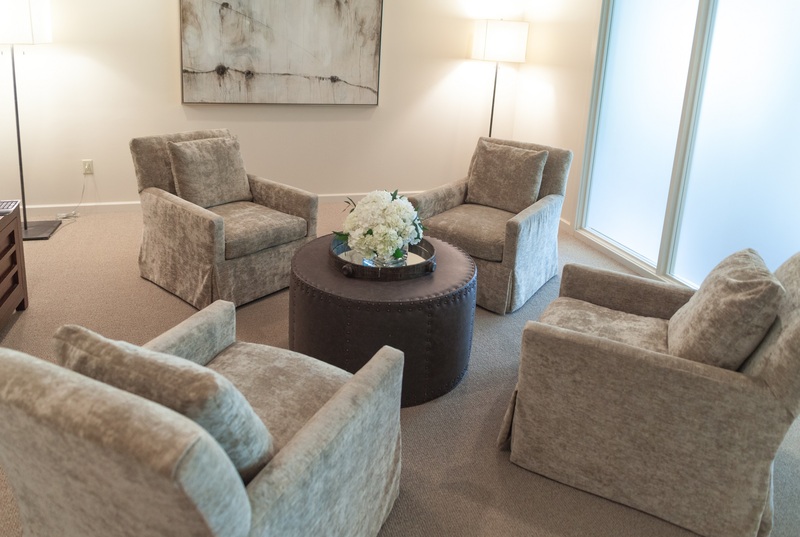 This was done for the comfort of both Bridgeworth’s clients and its employees. As a result, the office is decorated in neutral tones, clean lines and comfortable residential-leaning furniture. It is neither distinctly feminine nor distinctly masculine. I asked Zell if she thought the firm’s office space had an effect on gender diverse recruiting because, unlike most financial services firms, 63% of Bridgeworth’s employees are female AND 63% of its management team is female. Zell said that male and female employees alike love the space. It has been well-received by clients as well. It feels, arguably, gender neutral. I am not suggesting that a lobby refurbishment alone will improve gender diverse recruiting. However, if a company is focused on improving the gender diversity of its workforce, it may want to consider how well its office space reflects that focus. If it is time for a relocation or just a space refresh, perhaps recruiting should be considered when designing a new space. Other aspects of office space that send more direct signals that women are the minority in a firm include restroom ratios and temperature standards. I had an engineering firm client that converted one full set of restrooms from female to male to reflect the firm’s ratio of men to women. Surprisingly, the firm’s management could not figure out why they were not able to recruit more women to the firm. As for office temperature, according to studies, the typical woman generates 35% less heat than the 40 year old male upon whom office thermal standards are based. As such, she needs the temperature as much as 5.4 degrees Fahrenheit higher than her male counterpart to feel comfortable. This problem can be remedied by finding a midpoint temperature that keeps both genders more comfortable or by creating more zones in a space’s HVAC system. As many companies and professional services firm talk about making a concerted effort to recruit and retain a more gender-diverse workforce, paying attention to creating a workspace that reflects a gender neutral culture – perhaps even before such a culture has had time to develop within the company – will contribute to attaining a more gender-diverse employee profile. Are Internal Staircases A Thing Of The Past? Clear, simple, insights on creative office space.